60 • March 2018 • S I G N & D I G I T A L G R A P H I C S WRAPS DIGITAL GRAPHICS that each section can be wrapped without seams. Planning the overlaps, and giving ourselves extra vinyl, will also speed up the installation. If the wrap has tight text placement or the text lands on a compound curve or some other distorted shape then we cut this text as spot graphics. The back- ground image can then be applied and the spot graphics are installed over the top. 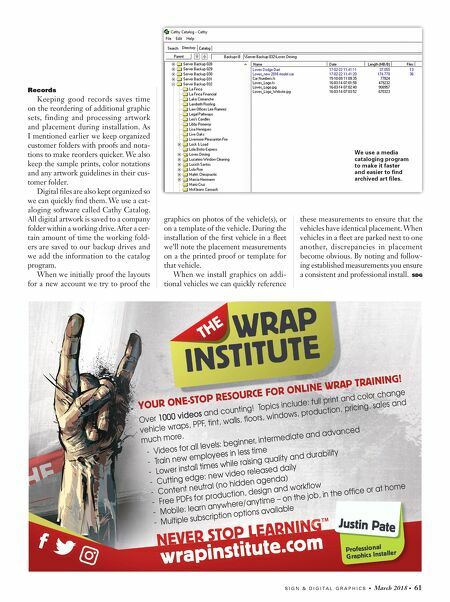 Although it's a two-step process, it is still faster than trying to keep text straight while working around those tight spaces during the installation of the wrap panels. Colors Keeping track of the customer's colors is not only important from a consistency standpoint, it also makes the design setup faster. If you have their colors saved from the initial art setup then each subsequent order can be setup that much faster. 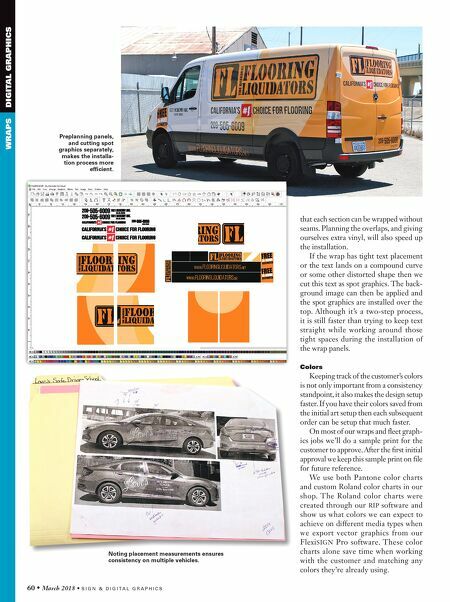 On most of our wraps and fleet graph- ics jobs we'll do a sample print for the customer to approve. After the first initial approval we keep this sample print on file for future reference. We use both Pantone color charts and custom Roland color charts in our shop. The Roland color charts were created through our RIP software and show us what colors we can expect to achieve on different media types when we export vector graphics from our FlexiSIGN Pro software. These color charts alone save time when working with the customer and matching any colors they're already using. Preplanning panels, and cutting spot graphics separately, makes the installa- tion process more efficient. Noting placement measurements ensures consistency on multiple vehicles.